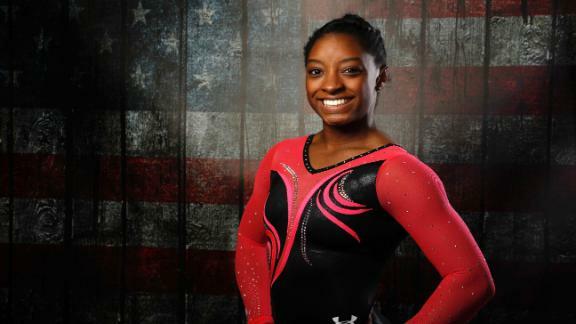 ESPN the Magazine senior writer Alyssa Roenigk shares what we can expect from Simone Biles, who is the favorite to win women's individual all-around at the Rio Olympics. As the U.S. women's gymnastics team prepares to take the floor in Tuesday's team all-around final in Rio de Janeiro, 5,000 miles away Robert Andrews will be triple-checking the Wi-Fi connection in his Houston home. A sports psychology coach who works with U.S. gymnasts Simone Biles and Laurie Hernandez, as well as a handful of other athletes competing in Rio, Andrews made the unforgivable mistake of waiting for the prime-time broadcast of Sunday's women's gymnastics qualification. "I won't make that mistake again," he says. This time, he'll experience every tumbling pass and Amanar vault in real time. "I blocked out my afternoon appointments all week and will be crying right along with them." 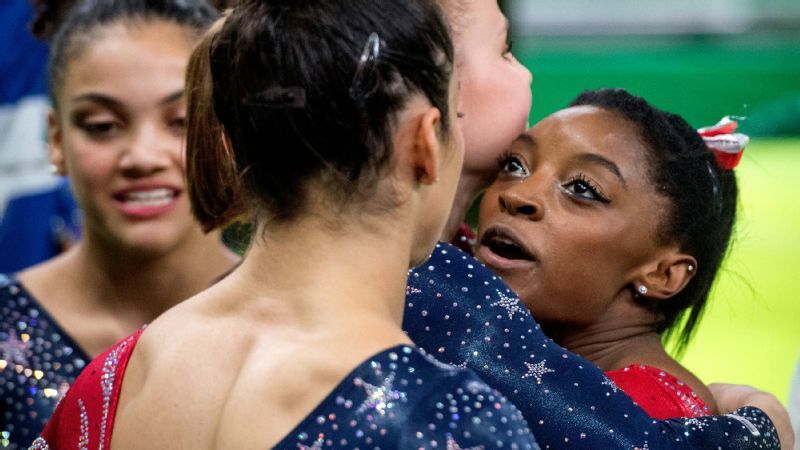 In the month since making the Olympic team, Biles and Hernandez have discussed their relationship with Andrews and the role mental coaching has played in their ascents as candidly as any elite athletes have been willing to do. That's a testament, Andrews says, to their openness and willingness to be vulnerable, look themselves in the mirror and work on their weaknesses. The fact that they admit those weaknesses exist in the first place, one of the toughest first steps for athletes of their caliber to take, is one of many reasons they are two of the most consistent gymnasts in the world. "It's remarkable they've been so vocal about it," Andrews says. "Most athletes, particularly male athletes, wouldn't dare talk about seeing someone in my field. I hope they open the door to our field being more recognized and supported, because it is vital." That is precisely why Ron Biles called Andrews in March of 2013 to ask if he would work with his daughter, whom he told Andrews was gifted at her sport but struggling to maintain confidence. He'd done research, and he believed Andrews had the experience and credentials to help his Simone break through her mental blocks. "He said, 'I've got a young gymnast who is too nervous and anxious, and she's struggling,'" Andrews says. "He asked if I could help." Andrews, the founder and director of the Institute of Sports Performance, is known around Houston for his work with the NFL's Texans, several collegiate programs and many gymnasts. In 2007, he began working with a handful of gymnasts who were being coached by U.S. men's national team coordinator Kevin Mazeika, including Raj Bhavsar, who went on to make the 2008 Olympics as an alternate before stepping up to help the team win bronze when Paul Hamm was injured shortly before the Beijing Games. Robert Andrews had been a sports psychology consultant for the U.S. men's team before he started working with Simone Biles. The next year, Andrews began a four-year tenure with USA Gymnastics as the sports psychology consultant for the men's team. He resigned shortly after returning home from the 2012 London Games and had no plans to return to elite gymnastics. Even that fateful call from Ron Biles gave him no reason to anticipate that, three years later, he would be glued to his computer screen watching his newest athlete compete in Rio. "When Ron called, Simone was having a really hard time, so I had no idea where she was going to go," Andrews says. "Something clicked quickly, and I thought, 'Well, here we go again.'" The first time they met in his office, Biles was anything but the open, up-for-anything client she is today. She sat slumped in a chair, shrugging her shoulders in response to Andrews' questions. After 30 frustrating minutes, Andrews finally got out of her why she was behaving with such resistance. "She said a gymnast on the men's team told her only crazy people go to see me," Andrews says. So he spent the rest of the session listing the athletes he'd worked with and what they'd accomplished together. Slowly, her posture changed. She agreed to continue their meetings, and each time they met, he says, she opened up a little more. Soon, Andrews was meeting regularly with Biles, her coach, Aimee Boorman, and her parents, all of which has been integral to the implementation of what he calls "the plan." "The plan is a methodical, focused path toward a goal, and it continues to evolve as the system evolves," he says. "Part of the plan was to quit being so nervous and anxious and build her confidence. She did that, and that won a national championship. Next was to have a good meet at worlds. It's like the universe. The plan continues to expand." So too, did his clientele. After Hernandez's coach, Maggie Haney, read about Andrews' work with Biles, she did some credential-checking of her own, tracked Andrews down and asked if he could help out Hernandez, whom she said was struggling with the anxiety of launching into the next stratosphere of her sport. "We worked on what I call E plus R equals O, or event plus response equals outcome," Andrews says. "Whatever happens, you choose how to respond, and the more mindful you are, the better choices you make." 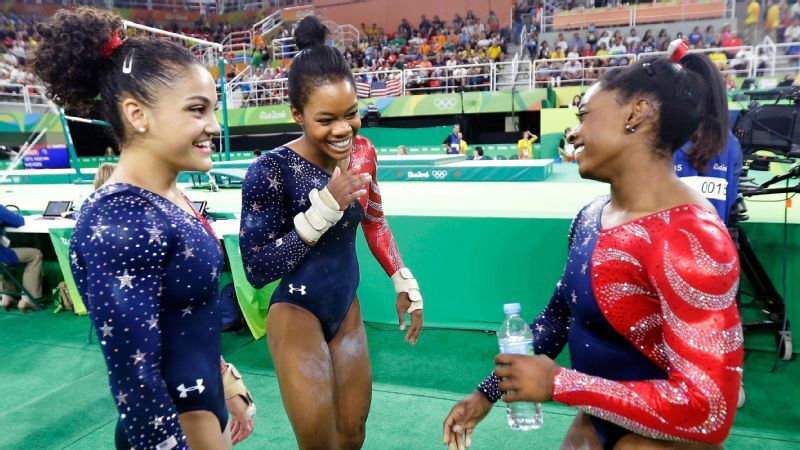 Lauren Hernandez, left, and Simone Biles, right, share a laugh with teammate Gabby Douglas after their floor routines during qualifying in Rio. He also taught Hernandez a breathing technique to help her relax before competitions. Watch Hernandez before each rotation, and she will place her right hand on her stomach, close her eyes and take a deep breath. "It's something we do at the office, but I never thought she would do it on the floor at a meet," he says. "I saw her do it at trials and thought, 'Man, that's pretty cool.'" Andrews says he knows the two women so well by now that he knew by the end of their floor routines Sunday that it was going to be a good night. With Hernandez, 16, whom gymnastics fans have dubbed The Human Emoji, it's all about her eyes. "If her eyes look light, her personality is right and her body will do what it's supposed to," he says. 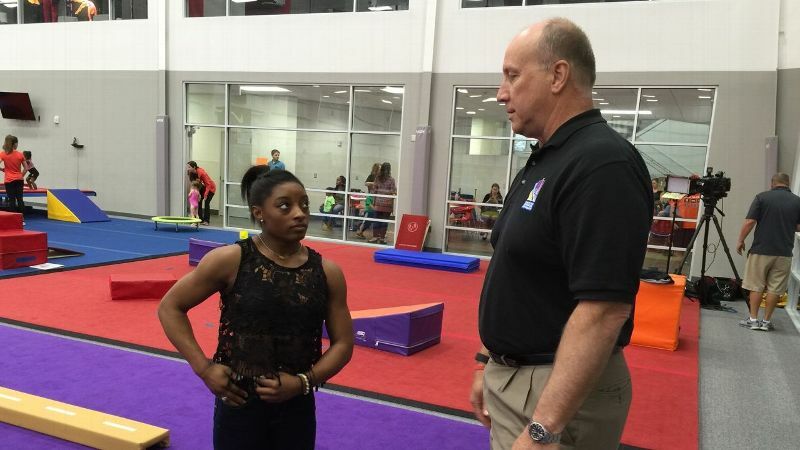 With Biles, 19, Andrews watches the landing on her first tumbling pass. "When she over-rotates, she's too amped up," he says. "When she sticks it, she's in the zone." That Andrews is not in Rio to coach the women in person speaks volumes to their readiness. "That is the ultimate compliment, for an athlete not to need me at the Olympics," he says. "We've done the work." Just as important with both gymnasts is the strength of the circles around them. "Think of the athlete, the coach and the parents or family system as the three legs of a stool," he says. "If there is a weakness in any one of those legs, it becomes unstable. With Simone, the stool is solid. Anything that causes instability in the plan diverts energy away from her training and performance. I don't know Laurie's family as well, but I believe her support system is just as solid. That's important. "Gymnastics is such an internal sport. There's not a lot of crowd interaction. It's you and the apparatus, and the more focused and confident you are, the more belief you have, the better you are able to deal with distractions." Over the past three years, as Biles has amassed four national and three world championship titles, her narrative has reached fairytale status. But her story is more superhero saga than fairytale, her meeting with Andrews the spider-bite scene and -- to continue the Spider-Man analogy -- her woeful performance at the 2013 Secret Classic four months later the Uncle Ben moment that sparked her transformation from struggling, anxiety-riddled gymnast with potential into the greatest the sport has ever seen. "Sometimes when great athletes struggle, they try even harder, which creates more struggle," Andrews says. "They're not trusting the talent they worked so hard to develop, and that creates more stress and frustration. She was a snowball rolling downhill. I had to convince her to take her foot off the gas, enjoy the game again. She was so stoic at meets. It didn't look like she was having fun. 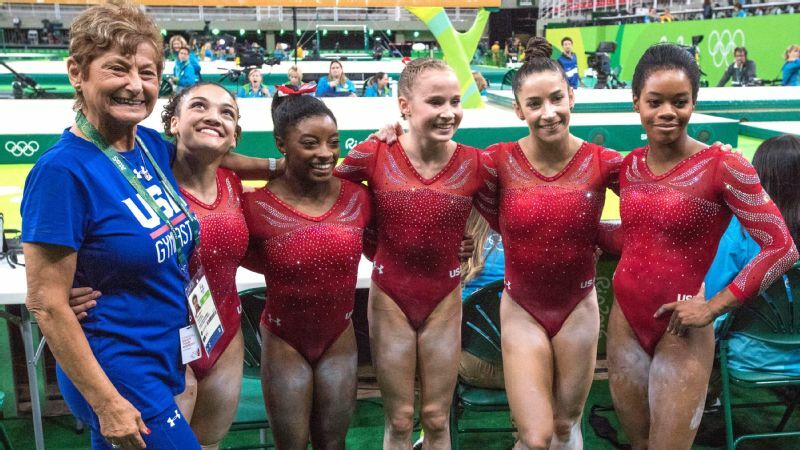 Once she began interjecting that Simone smile into her floor routine, the fans and judges started smiling, too." In the three years since the Secret Classic, Biles is undefeated in all-around competition, an almost unthinkable truth in a sport as finicky as gymnastics, where only one gymnast since 1972 -- Lilia Podkopayeva of Ukraine in 1996 -- has held the world and Olympic all-around titles simultaneously. Belief is powerful. Confidence can get shaken or rattled, but belief is a knowingness in your heart that no matter what, you are great. A wobble on beam might shake Simone's confidence for a few seconds, but her belief in her ability will remain rock solid. By the time Biles leaves Rio, it is almost assured she will do so as the most decorated gymnast of all time. Hernandez, who is competing in her first major world meet in Rio, has been a rock for the U.S. team and could leave with two gold medals of her own. "It hasn't hit me that we're getting ready to watch Simone at the Olympics," Andrews says. "Some would say she is the marquee athlete of the Games and the greatest athlete in the world right now. And Laurie could win a gold medal on beam. I haven't really absorbed it all yet." At each Olympics, as we watch the greatest in the world compete, we launch investigations in an attempt to understand what makes them great. In 2008, crowds gathered around Debbie Phelps and asked about her son Michael's childhood, what he ate for breakfast, if his oversized feet really gave him an advantage in the pool. In 2012, it was Usain Bolt whose otherworldly speed the world attempted to dissect and understand. And here in Rio, Biles is the athlete whose talent is proving most difficult to decipher. What makes a gymnast great is tough to pin down. The sport exists largely outside of the PED debate, and all the talent, power, flexibility, grace -- or drugs -- in the world won't keep a gymnast's feet on a 4-inch beam while the world watches and the weight of expectations presses down on her 4-foot-8 frame. Unless, of course, her drug of choice is the power of belief, one of the most potent PEDs on the planet. "There is confidence, but then there is belief," Andrews says. "Belief is powerful. Confidence can get shaken or rattled, but belief is a knowingness in your heart that no matter what, you are great. 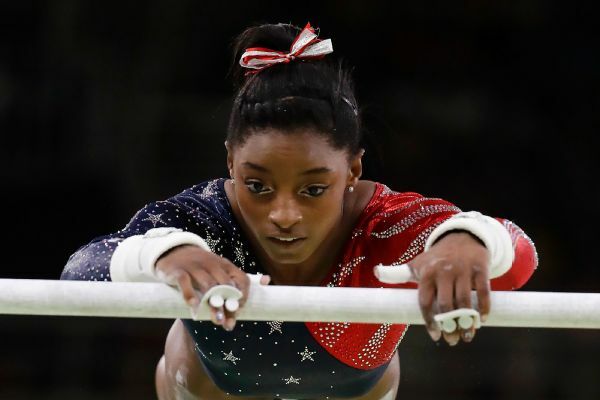 A wobble on beam might shake Simone's confidence for a few seconds, but her belief in her ability will remain rock solid." Believe you're the best in the world -- and back it up with talent and hard work -- and you will be. As the late Yogi Berra once said of the game of baseball, gymnastics is "90 percent mental, and the other half is physical." Biles has mastered both sides of that equation, even if, on paper, they simply shouldn't add up.